This is a common seaside sedge which you can find in mud flats, salt marsh or at the top of a beach with other typical seaside plants like Aster tripolium (Sea Aster). It is instantly recognisable because of the very long bract which sticks out way beyond the flowers or fruits. The bract (which looks like a long leaf) often sticks out almost at right angles to the plant and sometimes it is fairly upright. 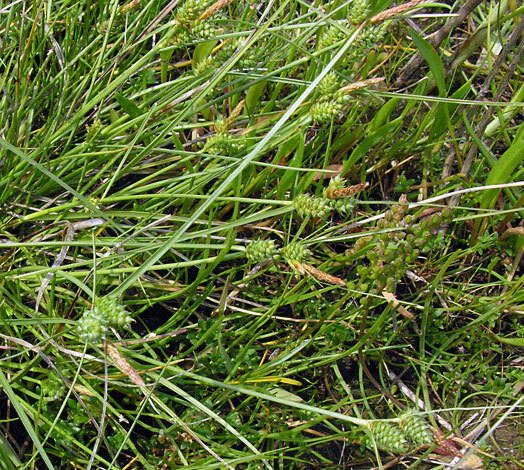 The plant itself grows in distinct tufts. This plant is hardly ever found inland but is extensively recorded on Irish coasts and western coasts of Britain. It does occur in the east but less often.